For Senate Candidates, It's Gaffe Season : It's All Politics If a politician from Iowa is going to commit a gaffe, it's probably best if it doesn't involve farmers. And in Kentucky, stay away from college basketball-related blunders. 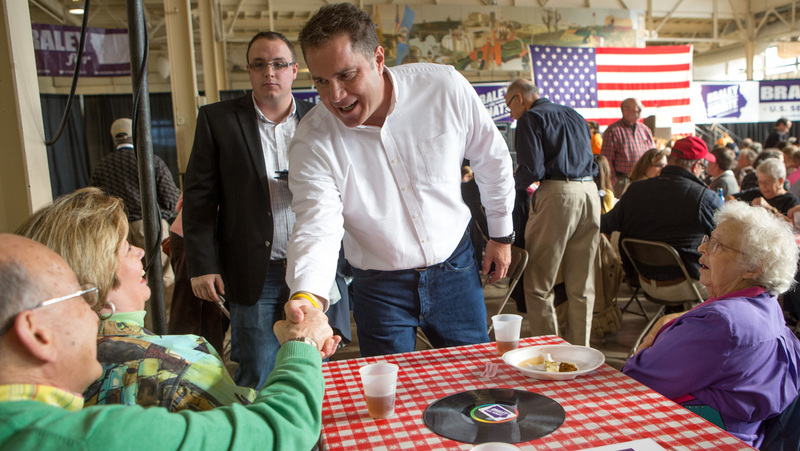 U.S. Senate candidate Bruce Braley talks to supporters Karen and Dennis Swallow during a barbecue lunch in October 2013 at the Iowa State Fairgrounds in Des Moines, Iowa. If a politician from Iowa is going to commit a gaffe, it's probably best if it doesn't involve farmers. Or if he represents Kentucky, it's best if college basketball isn't at the heart of it. Both are home-state icons. That explains why Democratic Rep. Bruce Braley of Iowa was so quick to apologize Tuesday after being captured on video dismissing the qualifications of the state's senior senator, Republican Charles Grassley. Braley, a former trial lawyer running to replace retiring Democratic Sen. Tom Harkin, warned a roomful of lawyers in Texas that the Senate could end up with "a farmer from Iowa who never went to law school, never practiced law, serving as the next chair of the Senate Judiciary Committee." Most Iowans may not be farmers anymore, but the state's farming legacy still looms large, as anyone who has ever been to the Iowa State Fair can attest. In Kentucky, it was Sen. Mitch McConnell, who faces tough primary and general election challenges this year, committing a foul in a campaign ad that accidentally included an image of the 2010 Duke University basketball team. In Kentucky, home to the University of Louisville and University of Kentucky basketball powerhouses, that's no subtle mistake. It was only compounded when McConnell's image-makers later swapped in some video of Kentucky hoopsters, then learned that the ad ran afoul of NCAA rules since it could be read as the players endorsing McConnell. Team Mitch apologized, through a spokeswoman who happens to be a University of Kentucky alumna. Between the Braley and McConnell gaffes, Braley's may be the more damaging. The farmer comments were straight from his mouth, not some sloppily edited video footage from a campaign vendor. Not only did Braley arguably dis farmers; he took a needless swipe at Grassley, who's been a staple of Iowa politics for decades. "It unnecessarily picks a fight with a political icon, Chuck Grassley, who's arguably one of the most popular political figures of our time," David Yepsen told It's All Politics. Yepsen, a longtime Iowa political reporter, is the director of the Paul Simon Public Policy Institute at Southern Illinois University. "It was just silly; it was just a dumb thing to say," said Yepsen. Yepsen noted that Braley has apologized and that Election Day is still many months away. But "we're going to see that over and over again in attack ads." The bar cart in the video shot and the audience of trial lawyers doesn't help. What surprises Yepsen and no doubt a lot of other people is that politicians apparently still don't get that in the age of Twitter, YouTube and Vimeo, everyone they encounter is essentially a reporter, even at private fundraisers. "After Barack Obama and God and guns, and Mitt Romney and 47 percent, they still think it's OK to go in there and say something they wouldn't dare say on the outside," Yepsen said, referring to past campaign trail controversies where a candidate's seemingly private comments were made public. "There are too many smartphones around."